Tomorrow, September 27 is the big reveal of our 2019 One City, One Story selection! 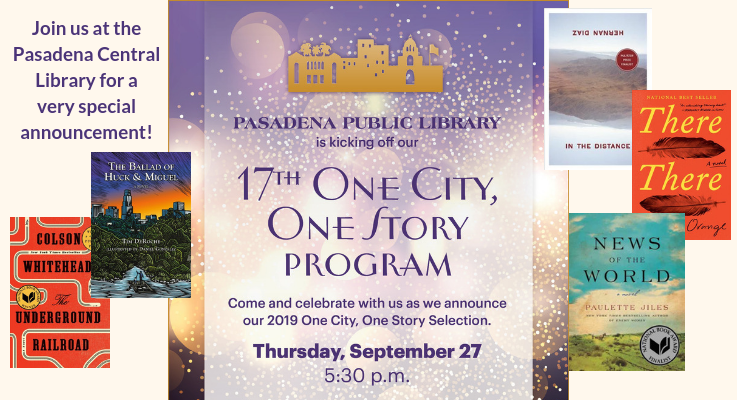 Come by the Central Library at 5:30 pm to be the first to know what our 17th One City, One Story book will be. Below is more information about each of the nominated books as well as links to their catalog records so that you can request them. No matter what the selection is for our City-wide program in March, all five of the nominees are well worth a read! In this retelling of Mark Twain’s The Adventures of Huckleberry Finn, Tim DeRoche dares to imagine that Huck Finn is alive today. Chased by his vengeful and psychotic father, Pap, Huck escapes down the concrete gash that is the Los Angeles River with his friend Miguel, an illegal immigrant who has been falsely accused of murder. Riding the dangerous waters of a rainstorm, the two fugitives meet a strange cast of Angelenos both animal and human who live down by the river. And they learn the true value of love and loyalty. The Ballad of Huck and Miguel is not only a thrilling urban adventure, but also an inspired tribute to one of the most beloved novels ever written. Tommy Orange’s There There is the story of twelve unforgettable characters, Urban Indians living in Oakland, California, who converge and collide on one fateful day. As we learn the reasons that each person is attending the Big Oakland Powwow—some generous, some fearful, some joyful, some violent—momentum builds toward a shocking yet inevitable conclusion that changes everything. Jacquie Red Feather is newly sober and trying to make it back to the family she left behind in shame. Dene Oxendene is pulling his life back together after his uncle’s death and has come to work at the powwow to honor his uncle’s memory. Opal Viola Victoria Bear Shield has come to watch her nephew Orvil, who has taught himself traditional Indian dance through YouTube videos and will perform in public for the very first time. There will be glorious communion, and a spectacle of sacred tradition and pageantry. And there will be sacrifice, and heroism, and loss.